Kyle Zimmer walked the bases loaded to open the Tigers' half of the seventh inning. DETROIT — With only four previous starts in the major leagues, Spencer Turnbull was easily the least experienced member of Detroit’s starting rotation. That made him an interesting choice to start the home opener — but the 26-year-old right-hander was up to the challenge. Turnbull struck out 10 in six chilly innings, and the Tigers drew four straight walks to start the bottom of the seventh, taking the lead for good in their 5-4 victory over the Kansas City Royals on Thursday. Josh Harrison stole two bases and scored three times for Detroit. The temperature at game time was 39 degrees. 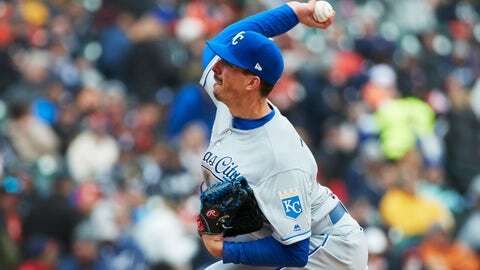 It was tied at 3 in the seventh when Kansas City reliever Kyle Zimmer (0-1) walked Harrison, Nicholas Castellanos and Miguel Cabrera in succession. Kevin McCarthy then came on and walked Niko Goodrum on four pitches, forcing in a run. Turnbull, impressive enough in spring training to earn a spot in the rotation, allowed two earned runs. He yielded six hits and two walks but prevented Kansas City from any big innings. The Royals have lost four straight after winning their first two games this season. Detroit’s five runs were a season high. The Tigers had scored only 12 runs through their first seven games. Detroit’s outfield wasn’t sharp defensively, and that helped Kansas City score two runs. An error by Castellanos in right field allowed Gordon to score from first on Jorge Soler’s double in the first. In the fifth, Goodrum was unable to cut off a ball hit to center, and Merrifield ended up with a leadoff triple. He came home on Gordon’s sacrifice fly for a 3-2 lead. Cabrera hit an RBI single in Detroit’s two-run first. Royals starter Jakob Junis allowed three runs in six innings. Yost on Gordo: "He's as locked in as he's been in a while." Mary Wilson of the Supremes sang the national anthem before the game, and former Detroit reliever Guillermo Hernandez was on hand for the ceremonial first pitch. Then the Tigers went out and improved to 5-3 — a nice start for a team coming off back-to-back 98-loss seasons. The Royals hadn’t made an error all season before a pair of miscues Thursday. Catcher Martín Maldonado had a throwing error in the fifth, and Merrifield, playing second base, followed suit in the sixth. Tampa Bay is the last remaining team without an error. Tigers: Detroit is without OF JaCoby Jones (left shoulder), and his absence appeared to hurt the Tigers defensively. Royals: RHP Jorge López (0-1) takes the mound Saturday. He allowed four runs in five-plus innings against the Chicago White Sox in his first start this season.